Officially opened in 2010, the 16-acre Midtown Crossing community has become one of the most popular neighborhoods in the Omaha area. With the diverse selection of restaurants, shops and community events, we are not surprised that so many Omahans are in love with this area — because we are, too! If you haven’t visited Midtown Crossing yet, or you’re just curious about what you should do during your next visit, we’ve got you covered! We compiled a list of all of the things you can do and see in Midtown Crossing. From grabbing a local beer at a taproom or playing a board game while sipping on a latte, there’s something for everyone. Enjoy! 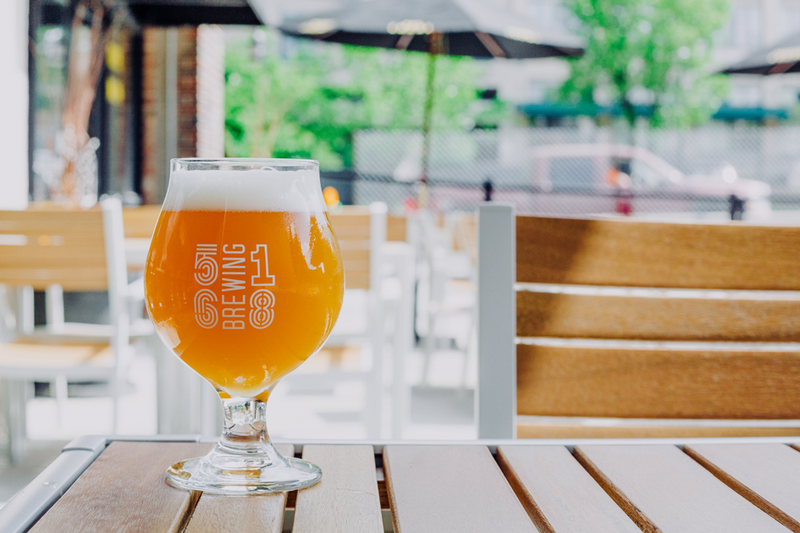 5168 Brewing Tap Room | American — This local taproom offers a full lunch and dinner menu, including several types of grilled cheese sandwiches, specialty sandwiches, salads and soups. They also offer a variety of locally brewed 5168 Brewing beers. Black Oak Grill | American – Enjoy quality steaks, juicy burgers and gourmet sandwiches on their dog-friendly patio with gorgeous views of Turner Park. Café Costa | Café & Bakery — This café resides on the Farnam side of its sister restaurant, Della Costa, and boasts floor to ceiling views of city life along with fantastic coffee and freshly baked goods. Cantina Laredo | Mexican — Cantina Laredo features modern Mexican dishes, specialty margaritas and premium tequilas served in a sophisticated atmosphere. Cold Stone Creamery | Ice Cream — This popular ice cream chain allows you to customize your sweet treat any way you’d like. Culprit Café | Café & Bakery — This café offers a tantalizing breakfast, lunch and dinner menu, as well as a selection of artisan breads and freshly baked pastries. Enjoy your meal while sitting in an adorable and comfortable café. Della Costa | Mediterranean — Experience delicious and authentic Italian, French, Spanish, Moroccan and Greek cuisine all in one location. 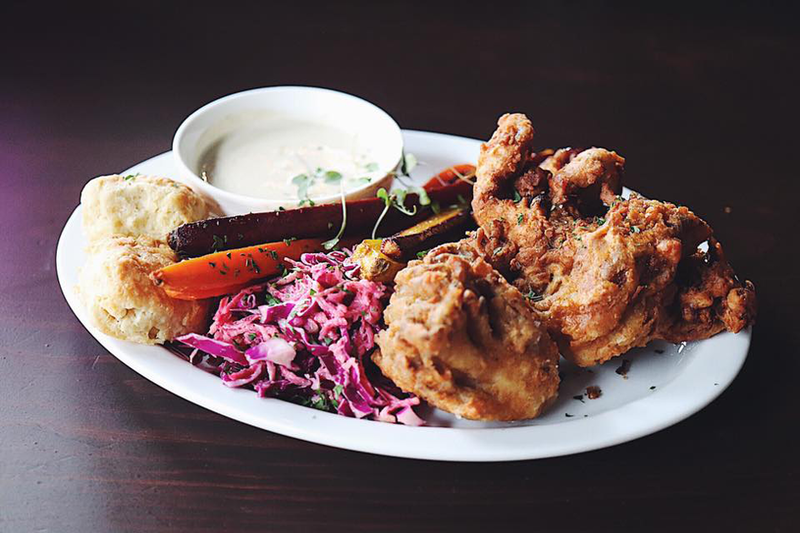 The Grey Plume | New American — This farm-to-table eatery creates cuisine that features locally-grown produce and livestock while also offering gourmet cooking classes to the public. Leadbelly | American — Enjoy an extensive beer selection, creative cocktails and innovated pub food from around the world. Liquid Sunshine Taproom | American — This brand new taproom and restaurant serves an extensive menu of freshly prepared appetizers, pizzas, wraps and sandwiches along with their wide selection of handcrafted cocktails and 48 craft beers. Modern Love | Vegan — Modern Love offers swanky vegan comfort foods using the freshest locally sourced ingredients possible. 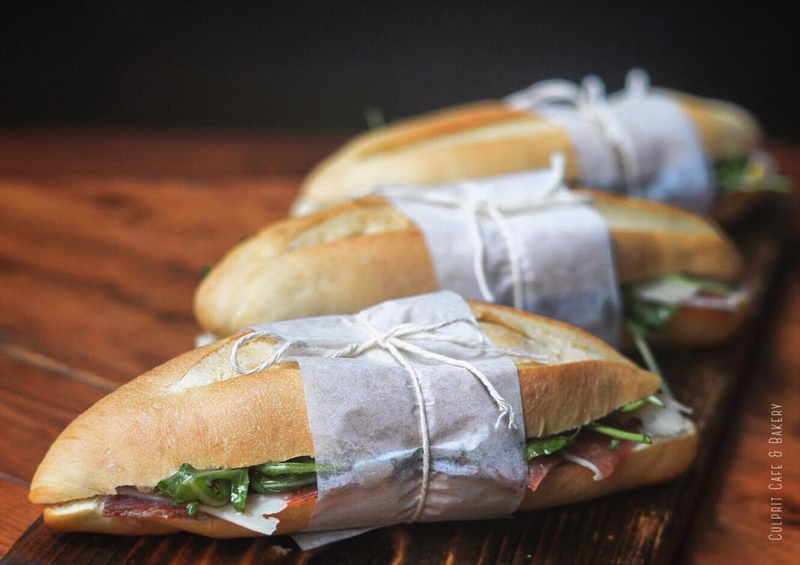 Pickleman’s | American — In a comfortable and friendly environment, enjoy delicious sandwiches, pizzas and salads. Proof | Whiskey Bar — In addition to their wide variety of premium whiskeys and bourbons, Proof also offers wine, craft soda and quality brews. Rocky Mountain Chocolate Factory | Sweet Treats — Experience dessert heaven with handmade premium chocolates, caramel apples and other mouth-watering confectionaries. Ray’s Wings | American — Ray’s offers unbeatable buffalo wings and chicken tenders along with other favorites, such as burgers, sandwiches, griddle fare and ice-cold brews. Thirst Tea Café | Tea — Thirst Tea Café serves flavor-infused teas from Passion Fruit Jasmine to Match A Milky Tea. Each drink is topped with their signature “bobas” and sweetened to perfection. 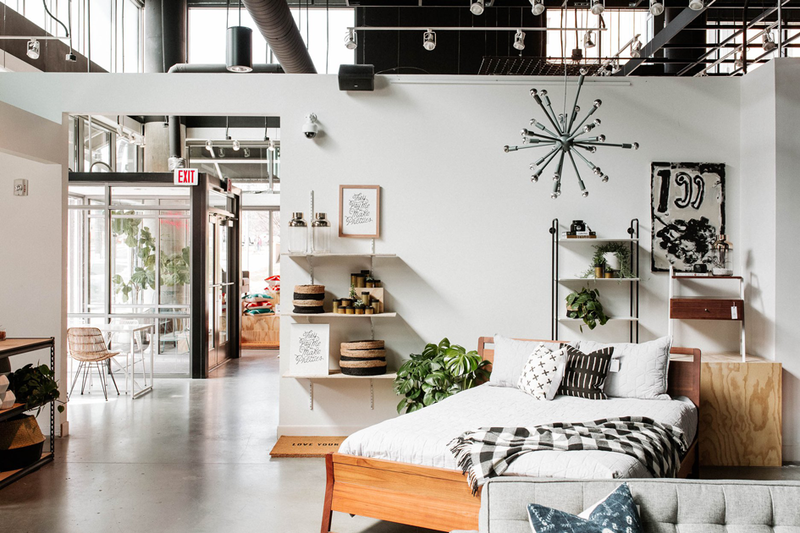 Hutch | Furniture — Hutch is located in a 4,300 square foot, beautifully decorated space and sells furniture, rugs, art, lighting and other home decor from over 40 modern brands, 20 local makers along with found vintage pieces. The Afternoon | Gifts — The Afternoon is Omaha’s destination for unique and unusual gifts, such as jewelry, books, pottery, frames kitchen gadgets and more. Long Dog Fat Cat | Pets — Long Dog Fat Cat sells anything you could possibly need for your furry friend, including all natural pet food, homemade dog treats and custom cakes. They even offer stress-free grooming. Wohlner’s Grocery & Deli | Grocery — For over 100 years, Wohler’s has been a go-to destination for affordably-priced groceries, the freshest produce and artisanal goods. Corky Boards | Arts — At Corky Boards, you get the chance to design your own wooden sign from scratch — all while enjoying a beverage from the bar and listening to great music. 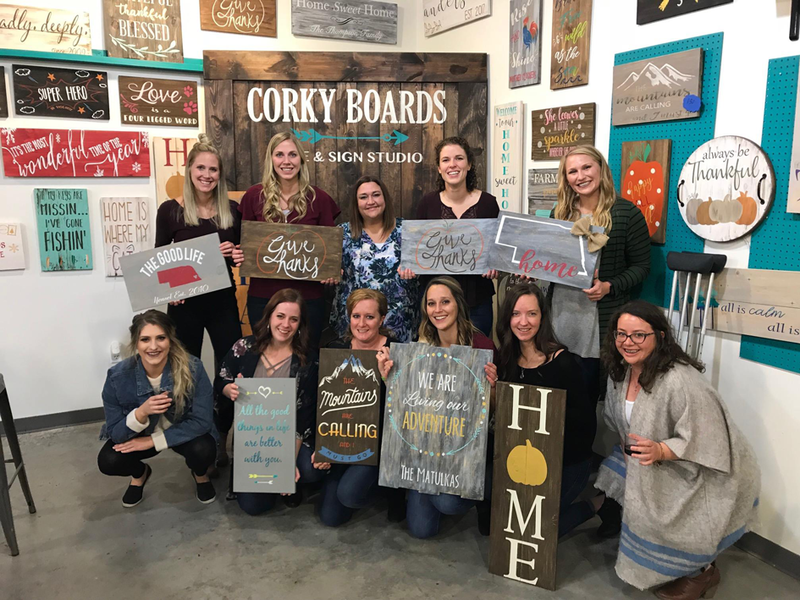 The Corky Canvas | Arts — From the owners of Corky Boards, The Corky Canvas allows you to “uncork” your creativity by creating a piece of art with a glass of wine in one hand and a paintbrush in the other. The Spielbound Board Game Café | Games — This eclectic non-profit is a board game library where you can play either classic or modern board games while sipping on a freshly brewed cup of coffee. Visit Midtown Crossing during the summer for an energetic blend of outdoor yoga, live music, community artists and performers. 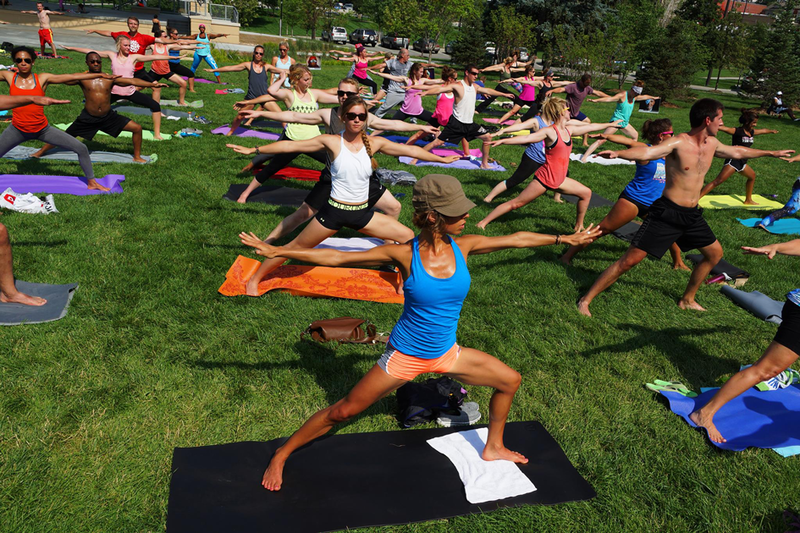 Yoga Rocks the Park is free and open to yoga enthusiasts of all levels. Participants are encouraged to bring their own mats and a water bottle. One night a month from May to September each year, Turner Park turns into an eclectic marketplace filled with trendy vendors, food and entertainment. Several shops around the park participate and offer exclusive drinks and dishes for you to enjoy while perusing vendors and listening to live music! Looking for something to do this summer? Join the Big O Bocce Ball league in Midtown Crossing. You can learn a new sport and meet new people! The league plays every Tuesday throughout June and July. 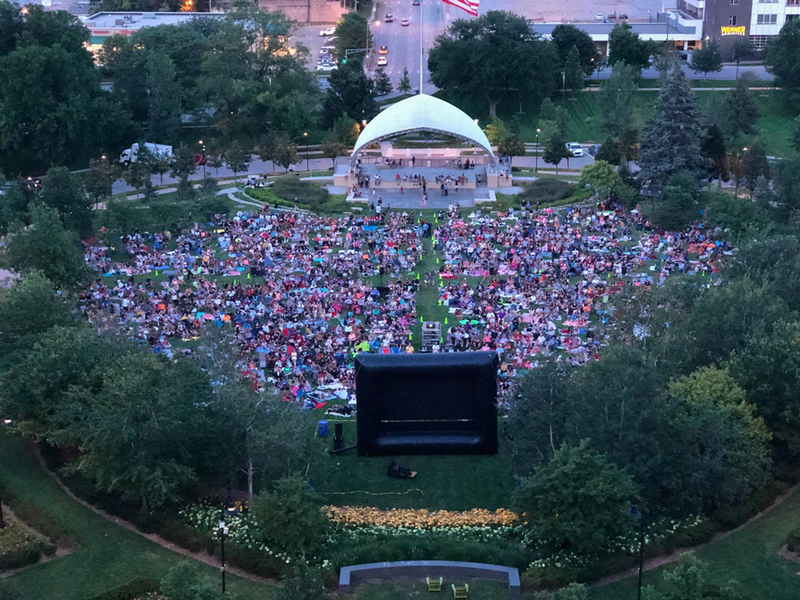 Head out to Midtown Crossing every Monday this summer and watch a family friendly movie in the park! Feel free to bring a chair or a blanket and enjoy concessions and beverages from Midtown Crossing restaurants. This free outdoor summer concert series has been an Omaha favorite for over 15 years. For two days every summer, come out to Turner Park and watch local bands perform while enjoying concessions from your favorite Midtown Crossing restaurants. Don’t worry about leaving your family at home — this event is kid and dog-friendly! Enjoy lovely jazz music while you soak up the beautiful sights of Turner Park during Jazz on The Green during the summer. Every Thursday, experience a new jazz artist and delicious fare from the local restaurants. 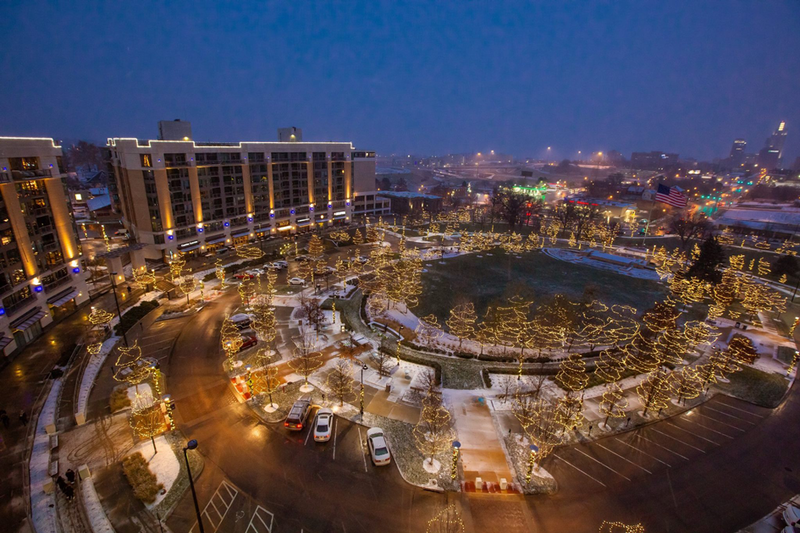 Midtown Crossing is the perfect place to spend a wintery evening. Stroll past a parade of dazzling window displays that are created by local nonprofits, students and individual artists. Be sure to vote for your favorite! While you’re there, stop into a local café for some warmth and a cup of hot chocolate. Midtown Crossing offers free parking for up to three hours, giving you an abundance of time to do anything on this list! Plus, if you want to spend all night in this awesome neighborhood — you can book a room at The Element. Let us know what your favorite thing to do in Midtown Crossing in the comments!